There’s nothing fun as having a home cinema. With a home cinema, you’ll never find the need to buy tickets to catch a movie in a cinema. You simply have everything you would need in a cinema right in your home. However, setting up a home theatre is not that easy. There’re many components involved. Getting a perfect cinema for your home demands getting everything right when choosing and connecting audio components. The kind of components you choose will determine the kind of sound you’ll get. Thus, making a wrong choice will render the entire set up disappointing. Therefore, it’s important to know the key differences between some of these components. The most confusing choice for many homeowners is choosing between AV receivers vs amplifier (preamp). Here’s is everything you need to know between the two audio equipment and make an informed decision. What’s An AV Receiver and How Does It Work? Basically, a receiver gets an input signal from a source. The input may be a satellite box, DVD player, gaming console, PC or any other supported source. The signal accepted by a receiver is either visual or audio. Once you select the input source, the preamp chooses that selected signal for amplification. The visual signal is processed and sent to the monitor and the audio is sent to a speaker through the receiver channels. In detail, one of the key functions of a receiver is decoding surround sound. Today’s sound technologies come in different formats. Thus, you need a way to process these formats into standard formats for amplification and output. A receiver is able to decode traditional analog signals into standard surround sound in a digital format. Surround sound is ideal in creating a cinema-like environment at home. An AVR is also responsible for receiving and switching between different video and audio sources. You simply connect all visual sources to the receiver. The output video signal goes to a monitor or projector, or whichever type of display you’re using. You simply switch between the sources you want to view using the receiver remote. Similarly, the receiver receives different audio sources. You connect all the audio sources you have. The preamp component of the receiver switches between the different sources and you can choose the source you want any time. Another key function of a receiver is amplifying audio signals. A basic receiver comes with five channels to power a surround sound speaker set up. Besides amplifying sound, it ensures that a signal goes to the right speaker. Advanced receivers support 7 to 9 channels. Also, some receivers come with a radio tuner. They play local radio stations while others come with support for receiving satellite radio at a subscription. Besides these functionalities, modern types come with Wi-Fi, Ethernet ports, Bluetooth, and other advanced technologies and features. Setting up a receiver is not an easy task, especially for a first time user. Just a look at the rear can send some users into despair. There’re many different types of inputs and outputs at the rear. While some of them may look similar in design, they serve different input sources and outputs. Thus, you should know what to connect where. Luckily, the ports are usually labeled for easier connection, but that can still be confusing when you don’t know what means what. When connecting audio or video sources, you need to connect to the correct ports. If your source has a digital audio out port, you’ll connect it to the corresponding digital audio-in port on the receiver. Most modern receivers accept audio input sources such as HDMI, coaxial, and optical. If your source doesn’t support digital audio, you’ll need to connect it using RCA. Ensure the R and L terminals from the source correspond to the inputs. As for video connections, you can choose between HDMI, video-in and component video-in. For outputs, you’ll also choose between audio out, subwoofer, HDMI out, video out, and component video out. You can also add an external amplifier and connect it through the pre-out port. Wi-Fi and Bluetooth connections are quite self-explanatory. You just need to attach a Bluetooth or Wi-Fi antenna to correct antenna port. Also, you can connect an Ethernet cable to the Ethernet port. After setting up all the possible connections, you might not get the best sound at first. You’ll need to calibrate the receiver for better sound. Most modern receivers have a microphone for calibration. Once you plug it in, it prompts for auto-calibration. Once prompted, you’ll follow the instructions displayed on the screen. Thus, everything is done automatically and you won’t struggle to tune the system manually. However, you can calibrate the system manually as you please. What Are The Benefits of Using an AV Receiver? Accepts multiple input sources- AVRs accept multiple types of inputs in multiple formats. You won’t be limited to the types and number of devices you can connect. For instance, you can connect a satellite receiver, DVD player, gaming console, PC and other such devices all at once. Easy to switch between sources- Since you can connect multiple sources simultaneously, you’ll not have to disconnect and reconnect cables whenever you desire to listen to a different source. You’ll simply switch between the sources with a remote. Amplifies signals- Receivers come with an inbuilt preamp and power amp for making audio signals stronger. Thus, you’ll get enough power to feed a multi-channel audio set-up. Reduces the need for multiple devices- When setting up a perfect cinema-like room at home, you need to include preamps, amplifiers, sound processors and other components. Luckily, a receiver comes with all those components in one unit. Thus, it reduces the number of components you’ll interconnect. This delivers a simpler set up. Outputs surround sound- A receiver accepts analog signals and processes them to give out standard surround sound for better sound. What Are the Limitations of using an AV Receiver? Since receivers have all the necessary components within them, they tend to be costlier. They come with advanced features and inbuilt components that push their price higher. Also, it’s complex to set up advanced receivers especially for first-timers. Receivers tend to be a little heavy. Thus, they need a strong cabinet for placement. It’s also challenging to troubleshoot and repair a receiver due to its multiple components. What’s a Preamp and How Does It Work? A preamp is important in an audio set up. It’s especially necessary to include in a good home cinema. Its main role is processing audio signals by increasing their voltage to levels suitable for amplification by an amplifier or feeding an active subwoofer. Thus, a preamplifier is used between an audio source and an amplifier. Basically, some audio sources are too poor to power a speaker or to be amplified. Thus, a preamp comes in handy to process weak signals to make them standard signals for amplification. Therefore, preamps offer voltage gain but not current gain. Although you can use a weak signal and amplify it the way it is, you’ll also end up amplifying all the noise in the signal. Also, using a weak signal the way and adjusting the volume of a powered speaker upwards will also turn up the volume of the noise. Thus, you need a way to first clear the noise in a signal before amplifying it. For instance, recording devices and instruments collect a lot of noise. If not processed, the final sound will be noise. A preamp comes in handy to process such audio signals to output cleaner signals for amplification. The end result is an amplified signal with minimal noise. Setting up a preamplifier is not complicated. The input ports are not confusing. You just need to ensure that you’re connecting a source to the right port. Most preamps support inputs such as HDMI, optical, coaxial and RCA. Ensure you use the correct cable for each port. Do the same for the output when attaching an amplifier. Make sure the amp is connected to the correct output port on the preamp. Once you set the preamp, you may use functionalities such as gain control, polarity reverse, low pass, and high pass controls. The most crucial functionality offered by preamps is gain control. Gain enables you to add the operating level of a signal. Some input sources require more gain than others. Thus, you’ll adjust the gain according to the signal level of the input source. Preamps also reverse the polarity of signals. This is especially important when connecting a preamp to recording instruments fed by multiple microphones. For instance, if you have a home studio and are using one microphone for your voice and another for your drum, the signals produced may not be in phase. A preamplifier corrects this by reversing polarities to ensure they’re in phase. Also, most preamps come with low and high pass filters. They assist in adjusting the level of a frequency but cutting out frequencies of a certain level. For instance, low pass filters cut out higher frequencies for more bass while high pass filters cut out lower frequencies for more treble. Thus, you can easily adjust the audio signal to your liking. What Are The Benefits of Using a Preamp? Easier to troubleshoot- A preamplifier is just a single component. This makes it easy to troubleshoot and repair problems. Comes with many control options- This audio equipment comes with controls for gain, low and high pass filters, volume, polarity reverse, and more. Enhances the quality of sound- A home cinema requires optimum sound quality for a great experience. A preamplifier is able to adjust sound and enhance its quality using its multiple controls. Noise reduction- Preamps themselves are low noise. They process and output cleaner signal. Affordable- Since preamps are just a standalone equipment with one main functionality, they tend to be more affordable than all-in-one audio equipment. What Are The Shortcomings of aPreamp? While it enhances the voltage of a signal, a preamp cannot feed speakers directly, unless the speaker has its own standalone power. Preamps don’t amplify the current of signals. Thus, you’ll need to pass an output of a preamp through an amplifier to amplify weak signals and make them strong enough to power passive speakers and subwoofers. AV Receiver Vs Preamp: Which one is better? 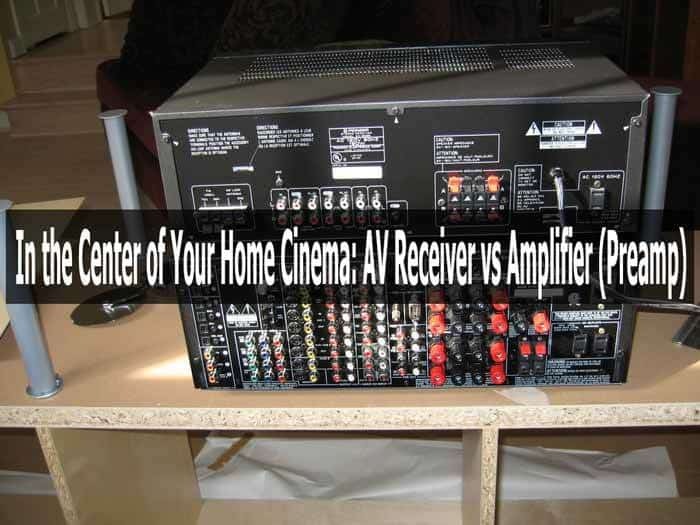 Now that you’ve understood the basics of AV receivers and preamps, it can be easier to compare an AV receiver vs preamp for the best home cinema set up. The choice you make should depend on the intended use. For instance, if you’re setting up the components in a small space, a receiver would be ideal since it has everything in one unit. On the contrary, a preamp will demand a separate amp, thus it’ll demand more space than a receiver. You’ll also need additional cabling for a preamplifier, unlike a receiver. On the same note, an AV receiver is more challenging to troubleshoot and repair since it comprises of multiple components, unlike a preamp that is easier to troubleshoot considering it’s just a standalone unit. It’s also easier to upgrade a standalone preamp than a receiver. Replacing a preamp with a better one is easier than investing in a whole new receiver. Also if you’re intending to connect smaller and less powerful speakers, an AVR will do. However, if you need more bass and want to connect more powerful speakers, you should go with a preamplifier since it will feed a dedicated amp to power more powerful, passive speakers and subwoofers.